Saturday morning, P came home from breakfast at a local diner to find me standing about six feet from the television watching Kevin Bacon in Stir of Echoes. I’d started out watching it on the exercise bike about an hour before. I had my work schedule set for the day: to work out, get cleaned up and get started on my pages. Films are a guilty pleasure for me. When he found me, I’d been standing there for about ten minutes trying to will myself into the laundry room to get a basket of laundry to fold so I’d at least have an excuse to sit down and watch the last forty-five minutes of the film. “Are you going to watch the rest of the movie standing there?” he said. “At least she’s not watching it in the little box with the program guide on at the same time.” This from my teenage daughter who knows my bad habits. “I just feel like I should be doing something,” I said. Of course, my husband knows my peculiar work ethic all too well. “Um, you’re a horror writer watching a really good film adapted from an excellent novel by one of the great horror writers of the twentieth century,” he said. I suppose if I had any dignity at all, I’d be embarrassed to tell this story. It only took me about ten seconds to shut off the overhead light and curl up in a chair to finish the film, (almost) guilt-free. I love Richard Matheson’s work. In addition to novels and short stories, he wrote screenplays–several of his stories were adapted for The Twilight Zone series. One of my very favorite novels is Hell House. But then there’s I Am Legend and The Shrinking Man as well. 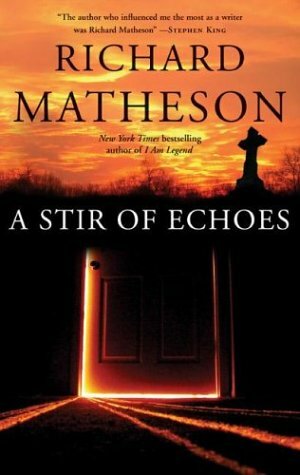 There are so many things that Matheson does well–but like The Shrinking Man, A Stir of Echoes demonstrates Matheson’s skill at showing how an average person might react in an extraordinary–even supernatural–situation. When his protagonist, Tom, is hypnotized at a party, he begins to experience psychic phenomena that nearly drive him mad. In the novel, he suffers a complete mental breakdown, losing his job and nearly losing his family. He lives in desolation, trying to make sense of what is happening to him. David Koepp’s screenplay changes many of the details, but it does an excellent job of translating the stunning tension in Matheson’s novel. The Tom in the novel comes far closer to the edge of sanity than Kevin Bacon’s character. He is stripped of everything that is dear to him–even before his affliction, there was a sense that his life was fragile. Everything is at risk. Bacon’s character is slightly more picturesque–but I found his deeply obsessive performance utterly sincere. Matheson’s heroes are always sincere, never ironic. How does Matheson create this kind of tension? Place is critical to the story. The action is in Tom’s head, his working-class neighborhood, his neighbors’ homes and, most significantly, in his own house. Come to think of it I Am Legend and Hell House are also narrowly-focused. Most of us live on similarly small stages. Ninety percent of my life is lived in zigzags between my kitchen, home office, living room, laundry room, and front porch–with occasional forays to the grocery store. I like the notion that there are terrifying story possibilities within such mundane vectors. Read the novel first, if you haven’t already. Then see the film. I’m embarrassed now that I haven’t read the book, because I really like the film (and know the art director, a visual genius — that movie LOOKS exactly right, don’t you think?) Off to the library tomorrow! The film is incredibly visually rich and looks amazing. The novel was written in 1958, and so when I read it, it seemed very stark and black-and-white in my head. But because the film was so well done, I didn’t mind the difference at all. No surprise here, but I love Matheson and I love the book and film of this one. One of the best-ever filmic depictions of a psychic event, when Kevin Bacon is hypnotized – a mindblowing shot/sequence that give me chills even now, just thinking about it.